In the world of college preparation, it is always wise to devote a good amount of time and energy to the ACT. Not only will this test aid in actually getting into a school, but it will also help to gauge which schools a student should be applying to. Additionally, a high score could balance a lower GPA and might also open a student to scholarship opportunities. Consider this: the ACT score makes up between 25-45% of a student's application score. Their grades and extracurriculars (and sometimes essays) make up the rest. As such, devoting a minimum of 25 hours in preparation for the ACT might seem like an adequate use of time for something that is that important to their college acceptance. 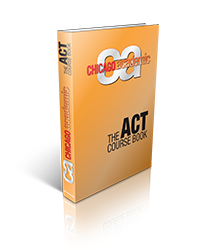 Due to its overall importance in the college application process, ACT preparation is highly recommended. There are a variety of ways to prepare for this exam, but the most recommended are group classes (either offered by your school or a private company) or private tutoring. While a student could certainly find success by purchasing the whole gamut of ACT preparatory materials (books, apps, etc. ), they are better off with additional instruction. Not only does this additional instruction aid in outlining study strategies, but it also benefits a student with testing strategy. In a group class setting, a student will be able to attempt practice tests and generally work through every section of the test with a qualified instructor. The benefit of group classes is that a student who already is a failry solid student will be able to consider a wide variety of possible strategies to work with. Conversely, with a one-on-one instructor, a student would be able to create an individualized testing strategy with their tutor. Additionally, they would be able to address any weaknesses or concerns that they have individually, versus dealing with the collective concerns of a larger group. Whether a student decides to prepare for the ACT on their own or with the help of classes or tutors, the point is that they need to decide to prepare. With that deciding comes ample planning. The ACT isn't something that should be ignored until the night before the test. If a student is serious about their college future, then they should be serious about preparing for the ACT. It should also be noted that a student does have the opportunity to take the test more than once. Therefore, if a student were to take the ACT without preparation, there would be opportunity for that student to then adequately prepare and take the test again.